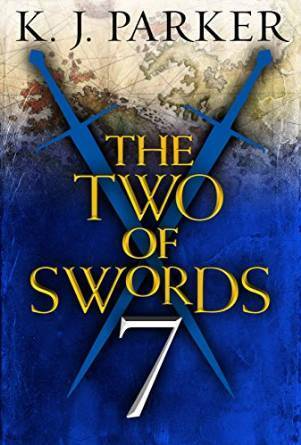 Two of Swords is the new serialised novel by K.J. Parker. The first seven parts are available now, and run to about eighty pages each. Further parts will be made available on a monthly basis. I’m going to try and put out a review for one of the currently available parts each week, and then review each new part in the month where it becomes available. Part Seven of the series keeps up the tradition of perspective changes. In this case, we’re taken into the mind of the Emperor, one of the men at the heart of the war tearing apart the Empire. We last saw him at the close of his meeting with one of the Belot brothers in Part Six, where he impressed as an avatar of acuity and focus. It’s interesting to see Parker bring back the motif of doubles again here – two Empires, two Belot brothers, whose personal struggles have ended with them leading the opposing empires for those Empires…and two Emperors. The Emperor we see here is not quite the same as the one from Part Six. He feels more vulnerable, more fragile. There’s meditations on age here – not least as the Emperor ascends a long set of stairs to the summit of his observatory. There’s also some discussion around mortality – events conspire to make our new protagonist aware of the fragility and immediacy of his existence. This segment is particularly short – something in the area of forty pages. Perhaps as a result, there’s not much exploration of the world in which the Emperor lives. I would have liked to have seen more of the palace. But it’s part of the growing ascension of intimacy in the segments – we began with sweeping events, seen at low levels, and now seem to be in an area of character studies of those who make, or think they make, the decisions everyone else suffers under. Most of the page count is spent, as above, on the Emperor, on his thoughts, feelings and desires, and not on events, per se. This is a piece of prose based on reflection, in the main. That isn’t to say that it isn’t fascinating. Parker’s trademark prose is in full spate here. There’s some wonderfully wry observations on both the Belot brothers, and the art of governing more generally. As ever, it’s a pleasure to read. And although the build-up is gradual, the narrative definitely carries some heft by the close. There’s a sense of events teetering on a cusp, of the opportunity for change, and the risk of stagnation. Parker takes the time, not to answer questions raised by previous segments, but to suggest that those questions do, in fact, have answers – and then to ask more questions. It’s not advancing the plot, so much as it is opening it up, giving the arcs so far a broader application, and leaving the situation open to change. Overall then, this is a decent segment in the ongoing story. We get an interesting new viewpoint, which also has quite a lot to say on the broader stage. And we get to see the plot begin to shift across the pages, events unfurling in new and intriguing ways. I tore through this, and enjoyed it immensely, despite the initial slow pace – I just wish it hadn’t been over quite as soon as it was! Something a little different today. 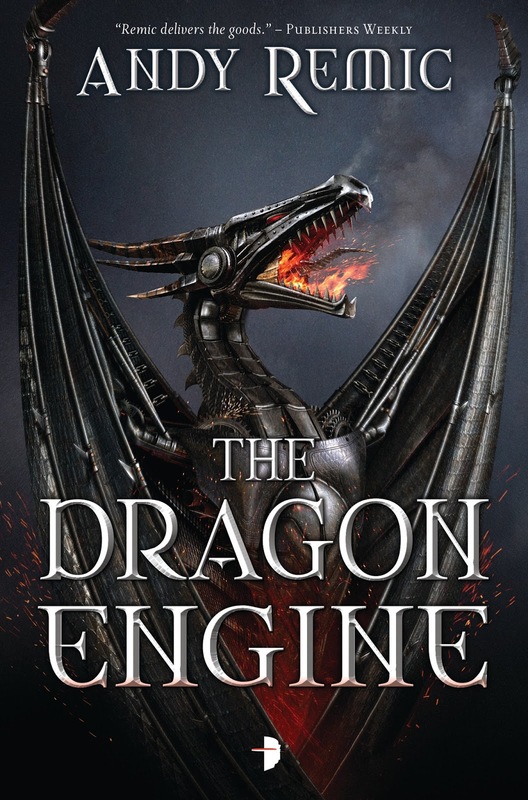 As yesterday's post indicated, we've got an interview with Andy Remic, author of The Dragon Engine (among many others), which is out on September 1st. As you can see from the below, Andy has a lot of interesting and insightful things to say, despite my bumbling questioning (cheers Andy!). Hi Andy – thanks for taking the time to talk to me. I’d like to start with a fairly broad question – who, in your own words, is Andy Remic? 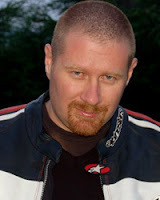 Andy Remic is an artificial construct sent from the future to inflict his particular unique brand of violent SF, fantasy and thriller writing on an unsuspecting public. The unsuspecting public are not quite sure what to do with him, but I suggest locking him in a big cage with tuna mayonnaise sandwiches, whiskey and a typewriter (and quietly letting him get on with it, or else he gets quite grumpy). The Dragon Engine is focused on a party of experienced adventurers , with a lot of old loyalties and grudges; what inspired you to look at things from this fresh perspective? In my previous novels, The Iron Wolves and The White Towers, the “band of adventurers” were a real nasty bunch, a deviant fistful of ne’er-do-wells, misfits and murderers. For The Dragon Engine I wanted a change of perspective – I wanted a band of noble heroes who then undergo, shall we say, nasty, life-changing experiences. When developing characters, I find conflict is great for driving forward characterisation, so to give the characters a rich history, as you say, with old loyalties and grudges, helps paint a much broader, richer world tapestry for the reader, and makes these guys more fun to write for the writer (i.e., me). There’s quite a large cast of characters throughout The Dragon Engine – do you have any particular favourites? I love Beetrax and Lillith, and their particular unfolding relationship, and I especially love Skalg, First Cardinal of the Church of Hate. I can see him and Beetrax having an interesting future together. Several of your ‘villains; in The Dragon Engine are conflicted, or have motivations which make them more sympathetic to the reader. Why did you take this path, rather than a more straightforward protagonist/antagonist set of relationships? I’ve always particularly loved the William Munny character in Unforgiven, that concept of a bad guy who’s actually trying to be good – but deep down, he really isn’t. It painted such a realistic picture of how complex us humans really are, and made the audience actually root for the bad guy. I think that film was part of a characterisation learning curve for me – the fact that there really is no good and bad, just (ahem, fifty) shades of grey. On the topic of characters – are any of them particularly difficult to write? To be honest, I plan out each character, even secondary ones, and give them a detailed history – even if it’s not always relayed to the reader in the text. For me, it makes them much easier to write, and you end up instinctively knowing how they react in any given situation. So no, planning is the key here. The setting of The Dragon Engine is clearly crafted with a great deal of care and affection – can you talk about the influences which led you to create these unique environments? I’ve wanted to write something about dwarves for a long time now, and whilst I’ve recently enjoyed Jackson’s Hobbit movies, I found the dwarves a little too comedic at times. So when I started writing this, I thought, let’s make them a really nasty bunch. That then helped define the world in which they lived – an environment of pain, oppression and torture. And as for the world of our “heroes”, Vagandrak, it was already created for The Iron Wolves so it was a simple revisiting of the M word. (You know, shhh, maps). There’s been discussion recently about ‘Grimdark’ and the evolution of the fantasy genre – what, for you, defines ‘fantasy’? I’m quite a traditional fantasy reader, I enjoy heroes, battles, magic, dragons, all the usual stuff. However, I recognise how harsh these environments would really be. Imagine the Vikings, or the Greeks, those battles where you actually hit somebody in the face with a sword or axe. Ouch. Horrific! So yes, for me fantasy has evolved from The Hobbit to a more violent and realistic representation of a fantasy environment. I mean – hobbits. Come on? I should write The Hobbit 2 – Hobbit Assassins From Hell. (This is intended as a joke, Tolkien fans. I’m actually a big fan... [ducks]). The Dragon Engine contains a great deal of action, alongside some excellent character scenes; which do you find the more difficult to write? Oooh, this fits in well. I’m actually re-reading a very old favourite, The Demon Lord by Peter Morwood. I approached Mr Morwood to ask if he’d read The Dragon Engine and provide me with a quote. I explained how The Demon Lord was one of my favourite all-time novels, and how the demon, Issaqua, still gave me goose bumps. I pulled out the book to check the spelling of Issaqua, and just started reading it again. Very sportingly, Mr Morwood agreed! And he read it. And gave me a great cover quote! That was a thrilling moment, getting a cover quote from one of your own literary heroes. I’m a part time teacher, so teach English to little monkeys a few days a week; the rest of the time is writing time where I cocoon myself in my book-lined study, light a few candles, pour myself a little tipple, and disappear into worlds of my own creation. The worlds become quite real to me, and I walk the mountains with the characters, living their adventures alongside them. And it really does become that immersive. It’s a bit like playing a video game – I’m in that world, guiding events. Around this I have a wife, two little boys, two Collie dogs, and an evil tomcat called Bruce – and I try my best to entertain them all. As a follow up: some authors plan their novels in great detail before setting pen to paper; others seem to take a more seat-of-the pants approach. How would you describe yourself on that continuum? I start off with a concept, then the designing of interesting characters, and setting out a broad outline of events. I write a synopsis and blurb. Then I usually plan the first half of the book, a paragraph per chapter. To do more is usually pointless because things change along the way during writing. So yes, I am a planner, but I also let my characters go where they please and change what they want. They tell me what to do!! It enables you to be more in touch with fans of your books, which is cool, although I’m not a big fan of Twitter if I’m honest. It seems there’s a lot of pointlessness goes on there (me included, ha ha). I’m finding Instagram quite pleasant at the moment – except I followed Example, and the bugger lives on it. Not a day goes by without a hundred photos from Example. Example! Get a proper job! I’m currently working on the follow-up to The Dragon Engine, called Twilight of the Dragons. I’m also working on three novellas for Tor US, A Song For No Man’s Land, Return of Souls and The Iron Beast, a dark, twisted fantasy set in the trenches of the First World War. And I also have an Iron Wolves short story in the fabulous fantasy anthology Legends II – Stories in Honour of David Gemmell, published by that great gent and author, Ian Whates at Newcon Press. You really have to be persistent. It took me (and most other authors) years to get published. I didn’t know anybody in the industry, but finally acquired an agent, then my first deal in 2001 (Spiral came out 2003). Ultimately, you have to write because you love it. I’d still be writing even if I wasn’t published. Writing is escapism and exorcism. Of course, nowadays there’s the self publishing route and some authors have been very successful that way. Budding authors have a lot more outlets nowadays, so good luck to you all! Get closer to the mayhem at andyremic.com. Tomorrow, we'll be doing an interview with Andy Remic, author of the bloody, dragon-filled and generally marvellous The Dragon Engine. He's got a lot of interesting things to say (my daft questions aside), so I hope you'll join us then! The Flux is the second part of a trilogy by Ferrett Steinmetz. It follows a magic user, Paul Tsabo, as he attempts to cope with the effects and consequences of using magic. It also examines his relationship with his young daughter, also a user of magic, as he attempts to keep her safe from harm whilst allowing her the freedom to grow. In between these emotional character arcs, there’s a fair few chases, explosions, and the occasional gunfight. The world that the author gives us in The Flux is an interesting one. It posits a world in which individuals with sufficient passion for a subject can work magic based around that subject. So there are bureaucromancers, videogame-mancers, moviemancers, cookingmancers – a whole cavcalade of passionate individuals, in a minority to the world’s population. But they have the power to change that world, in the limits of their passion – forms changing on demand for the bureaucromancer, food becoming lavish banquets for a cookingmancer, and so on. It’s an interesting system – with these individuals isolated and outnumbered, there’s plenty of room for conflict, and for discussion of individuals rights. There’s also the problem of the titular Flux – once a ‘mancer has changed the world to fit their whim, the universe punishes them with a backlash of bad luck. Each opportunity to work a miracle is balanced by the following disaster – usually to something or someone the ‘mancer holds dear. Steinmetz’s system is clever, and gives his magic a sense of emotional depth; the characters dare not act too far into the realms of fantasy, lest they be punished awfully by the universe for doing so. There’s also the possibility of government response – an army of ‘mancers madeinto a hive mind and set after their fellows, and the more common task forces of city police forces. It’s all plausible, if a little dystopian – but the idea of letting passion run free, and facing the consequences, is a powerful one, which sits at the core of this world, making it feel both vulnerable and real. That it looks at those consequences unflinchingly gives it a vibrant emotional truth. The central characters of this piece are Tsabo (the aforementioned bureaucromancer), his daughter Aaliyah, and their friend, Valentine. The latter is also known as Psycho Mantis, a dangerous and destructive videogame-mancer. Despite, or perhaps because of this, the extroverted Valentine gets on well with the more emotionally cautious Paul, and seems invested in both their friendship, and her bond with Aaliyah, as she tries to teach the little girl to live with her magic, and remain sane. Steinmetz writes Valentine as caring, pleasant, occasionally excitable, with a core of fire and steel that allows her to consider actions that Paul finds reprehensible. Paul, by contrast, has at his heart his relationship with his daughter – the author gives us a man determined to keep the most precious person in his life safe, at any cost – and that cost, in family stability, emotional health, and even blood, could be very high indeed. Aaliyah is portrayed with the emotional sensibilities of pre-teen – which given she is one, is a piece of spot on work by Steinmetz. She’s looking to keep her father safe, ironic given that he wants the same for her, but carries a more ruthless streak, willing to dare more to do so, whilst faltering over what kind of person she wants to be – whether she’ll be defined by her incoming power, or craft her identity in another way. There’s other relationships here - Paul’s relationship with his ex-wife, for example, is poignant, edged, and carries an undertone of caring that feels entirely real. But the core, that triad of affection, platonic and familial, between Paul, Valentine and Aaliyah, is the heart of the book. That relationship feels genuine – often fraught, sometimes sharp edged, but always with love at the centre – and Steinmetz sells it, making those three characters into real, caring people, based on the way they interact with each other. It’s an outstanding piece of character work. The plot, not to spoiler, begins with Paul and Valentine trying to generate a load of ‘Flex’, a sort of liquid luck. Things very quickly go downhill from there. There’s SWAT teams, hostile magic, and an effort by Paul to keep his seemingly crumbling family and friends together. The story serves the character relationships, but it isn’t afraid to land a few punches – there are moments of real emotional resonance, and Steinmetz isn’t afraid to show that Tsabo and his family live in an often deadly world. What starts off as a simple brewing operation quickly becomes something else, and the reader is gradually led into the wider story at the same time as their protagonist. The pacing is spot on, and by the end I was flipping pages quickly to find out what happened next, whilst hoping the book wouldn’t end. Overall, this one’s worth giving a look to. It has a strong core of characters, with well defined and evolving relationships. It has a world with an interesting backstory behind it, shifted from our own, but believable. And it has struggles against oppression, comments to make about marginalisation, and...did I mention massive explosions? There’s something for everyone here, and it’s all in a very neat package indeed. Having missed the first volume in the series, I'm looking forward to the next one immensely! 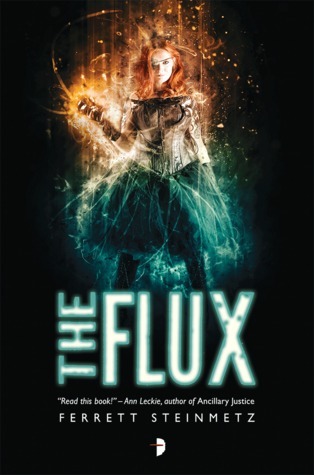 Tomorrow should see a review of Ferrett Steinmetz's The Flux. It postulates a world in which people with sufficiently strong passions on a subject are able to work magic with it. So we have bureaucromancers, videogame-mancers, and so on. It's got a really tight core as a story of family and understanding - and it's also got a load of explosions. It's been a lot of fun thus far. Engraved on the Eye is a collection of short fiction by Saladin Ahmed. There’s a couple of stories set in the same world as his novel (Throne of the Crescent Moon). However, there’s also several pieces set outside of that world, covering a broad span of locales and ideas. The first story in the collection, ‘Where Virtue Lives’ is set prior to the opening of Throne of the Crescent Moon, and sets out how the protagonists of that tale first met. Looking at the world from both characters perspectives, the narrative accentuates the differences between them very well. The old, cynical Doctor-and-Demon-Hunter stands as a stark contrast to the sword wielding, morally certain dervish. The clashes between their worldviews are evident in this short piece, and in fact it’s the author’s portrayal of these quiet conflicts that makes the text so strong. That said, the conclusion of the tale also indicates to us why the two of them are working together later in their narrative strand – whilst the conflicts between them are many and varied, Ahmed shows us that as a gestalt, the two are stronger than the sum of their parts – performing together what neither could do alone, and being greater thereby. It’s an interesting tale, and has a few things to say about comparative morality – but it’s also a solid adventure story. Next, there’s ‘The Hooves and Hovel of Abdel Jamela’, an exploration of how a court physician, exiled to a distant village, deals with a rather unusual request for aid. Ahmed evokes an intriguing world here, one where the supernatural is at the margins, feeling out of sight, but perhaps not out of mind. The stumbling physician is brought to life by a passion expertly portrayed, and a duty which is never explicitly stated, but lives in the actions of the narrative. The narrative has an element of whimsy to it, a feeling of quiet truth which was a joy to read. ‘Judgement of Swords and Souls’ takes us back into the world of ‘Throne of the Crescent Moon’. And into the environment of the dervishes – sword wielding fanatics with incredible focus. Ahmed gives us a focus in Layla bas Layla, a rare female recruit to the dervishes, and one of their best. She has to deal with aligning her personal moral code to what exists in the dervish institutions, and Ahmed does an excellent job of portraying her troubled state of mine whilst trying to do so. There’s also more than a few swordfights, evidence that the author can sit fast-paced action alongside exploration of a personal dilemma. The fusion of these two elements works perfectly, and makes for a compelling story – by the end, I definitely wanted to hear more of the protagonists’ adventures. ‘Doctor Diablo Goes Through The Motions’ is a piece which works on several levels. On the one hand, it’s taken from the viewpoint of a supervillain. He’s weary, cynical, and his internal monologue is both derisive and scathingly, hilariously, sarcastic about his fellow travellers in villainy. It’s a pleasure to read this view, and it certainly made me chuckle. But underneath this, there’s the character’s plan to reform prisons, an examination of how prejudice places people into a system from which there’s no escape – and the opportunity for a nuanced discussion arises out of the short prose, giving it an intriguing layer of nuance. ‘General Akmed’s Revenge’ , by contrast, carries a quieter payload of the fantastical. It’s effects are largely felt in the edges of the protagonist’s worldview, rather than more overtly. But the narrative, one of acceptance and ostracism in America, feels like a scalpel taken to the issue of race relations in the US. It’s a piece of sharp prose, given a weight of experience, and the voice of the protagonist feels raw and honest. It was in some ways a difficult read, and certainly a complex one – but also fundamentally honest, and captivating. ‘Mister Hadj’s Sunset Ride’ blends the familiar tropes of the US western with something of a more Arabesque nature. There’s a story here about a journey to deal with an outlaw and his unpleasant sons. It’s a good story, too. You can feel the hammer of the sun on hardpan, the slow creak of horses on the move across a wilderness. But there’s also a story about identity, the more culturally assimilated narrator working alongside a member of the preceding generation. Ahmed already negotiated this terrain in the preceding story, but here it’s done more subtly – in the asides the narrator throws in, the way actions of the older man throw him from his stride. It’s lovely to read – and the supernatural elements, which are finely laced throughout the story, tie these elements together into a cohesive whole. ‘The Faithful Soldier, Prompted’ takes us out of the subtly fantastical, and into a near future Egypt, shattered by a war of ideology. There’s some great ideas fluttering in the background here – I particularly enjoyed the idea of crusaders against credit interest. The Cairo seen briefly in the story is alive, but clearly battered, if not broken, and Ahmed does a great job of making the city feel lived in. At core though, this is a personal story, of a man on a journey which he has undertaken for the sake of love. His torments, trials and tribulations are brought to live, and the reader empathises and agonises alongside him. It lacks something of the environmental flavour of previous stories, but has a sense of the personal, of being genuine, which made it a great read. ‘Iron Eyes and the Watered Down World’, the final story, is a bit of an odd one. It begins with three companions, adventurers in a fantasy world – each with their own problems, supporting the others. And each of those characters has something about them, an aura of weariness, somehow tied to a core of vitality, which made me keep turning pages (that one of them is a murderous rabbit-woman is a bonus). The plot rumbles along nicely, and slowly the kind of story that is being told changes. This story works both as a straightforward adventure, and as a meditation on family, and was quite enjoyable on both levels. Overall, Engraved on the Eye is a superb collection of Ahmed’s work. There’s a range of genres approached here, and the stories aren’t afraid to ask big questions in between the personal, or even between swordfights. The voice at play here is a confident, compelling one, and the collection as a whole was a pleasure to read. 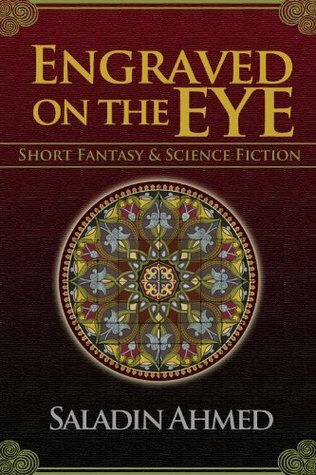 Continuing this week's theme of short fiction, tomorrow will see a review of 'Engraved On The Eye' by Saladin Ahmed. This collection contains several short stories set in the world of Ahmed's award-winning 'Throne of the Crescent Moon', as well as a great many more which are set in their own universes. They were, honestly, all rather good, and had some very interesting questions to ask and (possibly) answer. The SEA is Ours is an anthology of steampunk fiction, set in and around South-East Asia. It has a combination of new and previously published authors, and a very broad range of subject matter. That breadth of material is one of the reasons that this collection is so interesting. There’s a whole range of imaginative perspectives on display. There’s living wood, brought to life by a sculptor in defence of a homeland. There’s spiders in mechanical battlesuits. There’s a couple of mentions of the Aswang, demons of folklore, though they’re used differently across the narratives. There’s even one story which hinges upon the animal grace of flying whales - a spark of whimsical brilliance which evoked a sort of tense wonder in the reader. Essentially, these stories each have something of their own to say, and the way that each of them looks to say it feels different . In part, this is due to the other distinction of this collection. It feels like there’s a diverse range of views here, a cultural and social understanding of humanity distinct from that with which we’re typically presented. Each author has their own style, of course, but there’s a cohesiveness here, a flavour which is hard to define, but absolutely present. Perhaps some of it is highlighted in the several narratives of resistance – archipelago dwellers using clockwork colossi and grey-skinned monsters to defend themselves from external aggression. Or in the lucid dream-weft of a man using nano-machines to retrieve skin-flakes of the Bhudda from a rockface. There’s a sense of community, of cohesiveness and reaction against invasion, and the suggestion of an energy within that community which cannot, and indeed should not, be suppressed. So as a whole, the collection is imaginative, in part because it opens a window onto a rarely seen perspective. But the broader question remains – are the stories actually any good? The broad answer is that yes, they are. Characters are written in with swift brush strokes, but largely given enough room to define themselves to the reader. For example, we may not know the details that led to a tense interaction between two brothers in a workshop in one story, but the sense of a shared history infuses the text. It works its way off the page, and makes the characters feel real. Or there’s the curiously fraught father-daughter relationship in another tale – as the latter attempts to emulate the former’s rise into the skies, she learns some unpleasant truths about both her father and her society, and has to cope with that knowledge. And it feels right. It feels raw, and slightly askew, and filled with a kind of fiery complexity. Not all the characters are like this of course, but the protagonists for each tale manage the trick of seeming relatable, even those who might easily have been incomprehensible. The plots range from the fantastic through alternate history, and each of them feels like an effective narrative unit. There were some abrupt endings, which was unfortunate, because one thing that was shared by all of the stories is that I wanted to read more of them. The collection, taken as a whole, exudes a sense of the familiar made strange, accentuated by delving into a diversity of cultural approaches which aren’t often seen, each approached in a nuanced and effective fashion. Is this a collection worth reading? If you’re looking for something different, absolutely. It promises, and delivers, a series of compelling imaginative journeys, often showing off new directions, and conceptual spaces I, for one, was unfamiliar with – and delighted to be introduced to. On that basis – yes, this one is worth a read! Tomorrow we have a review of an exciting new anthology. 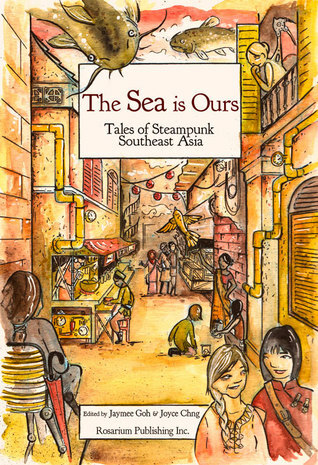 The SEA is Ours is a collection of steampunk fiction set in and around South East Asia. It's got some great, imaginative concepts, and a really interesting set of diverse narrative approaches. More tomorrow! Updraft is, at heart, a novel about relationships. It’s about a young woman, and her desire for self understanding. It’s about how she works with others, and how they shape her. It’s about truth, and power. That it takes place in a world where the cities are towers of eternally growing bone, and where learning to fly is as much of a necessity as learning to walk…these things are an added bonus. The world of Updraft is fascinating, and I’m not sure we’ve seen something quite like it before. The setting is the aforementioned bone towers. These bizarre structures are soaring well above the clouds. People live within hollowed out parts of the bones, a whole society locked within these confines. As the towers soar higher, the hollow spaces gradually close, leaving citizens constantly on a slow migration upward. Though the people are locked within their towers, they also have the capacity for travel, crafting wings which allow them to take to the sky, to visit the rest of their ever-rising world. At the same time, however, this sort of travel is not without risks. Unseen, unknowable terrors lurk within the skies, and are more than happy to reward a lack of caution with an unpleasant demise. That’s the setting in broad strokes. But the author has clearly laboured long and lovingly over her world. The whole thing feels fleshed out, feels real. From the weights that are attached to lawbreakers as a punishment, through the duty-bound terrors of the central Spire, into the mysteries of a Skymouth …everything hangs together perfectly. The city of towers feels like the real thing, and the way that the society is built around the requirements of living in the sky is utterly believable, and thoroughly immersive. The reader is quickly absorbed into a new, skybound reality, with its own vocabulary and social mores, its own customs and social expectations. Then, of course, we’re given a protagonist already submerged in that world, and are given the opportunity to follow her journey, to see if she will sink, or soar. In this instance, our protagonist is Kirit Densira, a young woman on the cusp of adulthood. As she prepares to take her flight test, which will allow her to travel between towers, she discovers that she has an unusual talent – and quite quickly afterwards, discovers that the mysterious, duty-driven and often callous governance of the towers, The Spire, keep an eye out for just that sort of talent. Things quickly spiral from there. Kirit is a great central character; she’s highly competent, but easily frustrated, entirely believable as a driven adolescent, trying to figure out just who she is, as her world is turned upside-down in front of her eyes. Wilde never lets her character wander off-piste – every skill is one gained or strengthened by hard work, each moment of insight surrounded by the context that brought it to the fore. Kirit isn’t flawless – there’s some moments of stubbornness that had me wincing, for example – but does feel very much alive. In a way, it’s a shame that the focus is on Kirit as much as it is. She’s our viewpoint onto other characters – her somewhat secretive mother, her platonic relationship with her best friend, her fraught interactions with the authority of the Spire. There’s a lot of great possibilities here, and where Kirit interacts with the supporting cast, we can see their potential. It would have been nice if they’d had a little more room to come into their own, rather than being foils for the protagonist – but this is Kirit’s story, and so the focus remains on her. The plot…well, I won’t spoil it, but there’s some good stuff here. Kirit’s journey into adulthood is filled with twists and turns, with conspirators with unclear motives, with red herrings, and dark mysteries. There’s also some actual fighting, in the air, with wings. The pacing is solid, and it kept me turning pages all the while; the story benefits from the solid world building, keeping the reader interested as we’re introduced to new places, new people, new modes of thought. There’s a couple of missteps, and areas where I would have loved to have seen a more in-depth explanation, but overall, it’s a riveting read. Updraft is, at the end of the day, a well done journey of a protagonist from adolescence to adulthood, surrounded by mystery and mayhem, and wrapped in a fantastically different world. It’s certainly worth picking up. 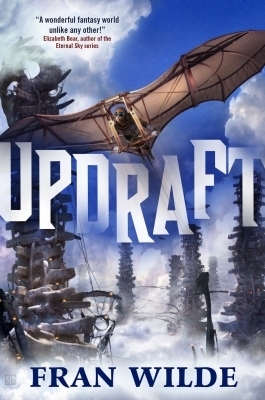 Monday will see a review of Fran Wilde's excellent Updraft - a story about a young girl learning to fly, both physically and metaphorically, in a city of bone-tower spires. It's original, interesting, and well done. 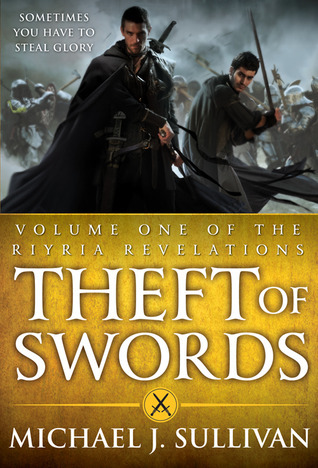 Theft of Swords is a collection of the first two novels in Michael Sullivan’s ‘Riyria’ series. It follows a pair of thieves for hire, as they become increasingly entangled in magic, mayhem and politics – at least partially by accident. The centre of both text are the duo of Hadrian and Royce, thieves for hire. We’re largely given insight into their characters by their actions, rather than any deep internal monologue, but those actions are enough, alongside some weapons-grade banter, to establish them as protagonists. Royce is the grimmer, more cynical one, more prone to selfishness (or pragmatism, depending upon ones point of view), with a few surprising chinks in what’s obviously a hefty set of emotional armour. He also sneaks a bit, indulges in the occasional bit of lockpicking, and has a fine set of one-liners for every occasion; those occasions may involve being in disguise, climbing up a tower wall, dodging the occasional lethal mythical creature, or…well, you get the idea. Hadrian, in contrast, is the more seemingly straightforward – a star swordsman, his initial pragmatic demeanour quickly falls away to reveal a heart of gold. Or at least silver. He’s the one standing toe to toe with the bad guys, chivvying his taciturn partner into action – and often finding increasingly unconvincing reasons why they should do the right thing. Sullivan manages to provide great chemistry in the duo; reading their scenes sometimes felt like a cross between Lankhmar and Die Hard. They’re aided by an excellent supporting cast of characters - again, largely defined by deeds and dialogue over internal struggles, but all eminently readable. There’s a few villains, especially in the first volume of the omnibus, that could have done with a bit more fleshing out – but some of that occurred in the second volume, and hopefully will continue through the series. The world, much like the characters, is well served by Sullivan’s tight descriptive prose. There’s no baroque flowering of excessive detail here, but a level of focused detail which keeps the reader both in the world and in the narrative moment. As the text progresses, the world begins to feel fleshed out, as institutions and characters are brought in, and given the chance to provide some exposition in amongst their scheming and/or heroics. I was particularly impressed by the depiction of a church populated by true believers, whose political actions actually form a key part of their theology. The plot of both volumes is, without spoilers, quite well done. It’s cleverly plotted, and each event sets up others later in the narrative. It’s a proper fantasy romp – a semi-heroic quest, largely entered into accidentally, with swordfights, magical monstrosities, a mysterious wizard, dead kings, scheming murderers…there’s a lot going on. It’s to Sullivan’s credit that he makes the whole thing flow together perfectly, leaving the reader turning the pages, desperate to see what happens next. Overall then, this is a fantasy adventure in the classic mode. It’s smart, funny, and sure of itself. There’s some nice red herrings shot through the text, and some interesting questions raised, but the broader form is simultaneously comfortably familiar and a breath of fresh air. It’s a charming story with a lot of heart, and I’d say it’s worth a read – though now I have to catch up on the rest of the series! 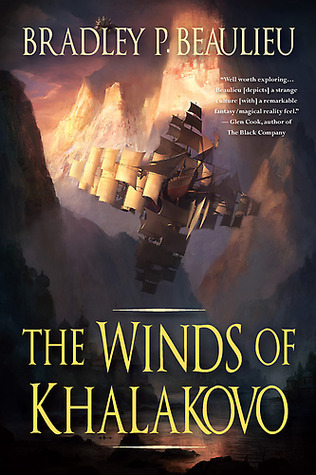 The Winds of Khalakovo is the first novel in the “Lays of Anuskaya” sequence from Bradley P. Beaulieu. It’s a doorstop of a book, filled with a deep, involving setting, characters circling each other with intrigues and agenda’s, and a plot which starts with a mystery, and evolves into an adventure with extremely high stakes. The setting of the novel, the titular Khalakovo (which is as difficult to spell correctly as it looks), is a triumph. An archipelago sits within an endless swirling sea; the islands, toweringly mountainous, are connected by airships, carving paths in a continual maelstrom of wind. The ships are kept on course through the use of elemental magic – each ship having at least one individual aboard who can summon and control the spirits of the wind. If that weren’t enough, the unique geography has been given human institutions a distinctly Russian patina. There’s a set of loosely aligned Dukedoms, under a non-hereditary first-among-equals. There’s a collective of wanderers and keepers of magic, implied to have been displaced in the past by the very ‘Landed’ Dukedoms they now serve. And there’s a rebellious offshoot of that collective, determined to throw aside the ‘Landed’ and change the world, for better or worse. It sounds complicated – and it is. Beaulieu manages to introduce a great deal of this through inference; hints or assumed knowledge are mentioned in dialogue. The history and structure of the world gradually unfolds before the reader, if they manage to keep up with the barrage of names and places. The setting, frankly, has an astonishing depth. Whilst I’m usually a fan of world-building through incidentals, in this case the reader can feel cast slightly adrift. People with complex names are performing complex actions, which at least initially, are rather unfamiliar. As the narrative context grows, these issues slowly disappear – but be aware that this is a world dense with concepts, and rewards the reader who gives the text their full attention. From a character perspective, the reader is presented with several different points of view. It’s not overwhelming – there’s nowhere near the level of view switching that readers of George R.R. Martin will be familiar with. It’s also interesting to see that the majority of the view time is split between women, one way or another – and Beaulieu isn’t afraid to show off his female characters as smart, competent protagonists. They suffer their share of pitfalls, of course, but in their relationships, and their actions, they’re far more than foils for the men of the piece. The relationship between the mistress of a Duke’s son and his wife-to-be is fraught, conflicted, and quite capable of putting the reader through an emotional wringer. The Duke’s son, our other protagonist, has at least a basic level of competence – no helpless orphans here, but a youth raised to power, grappling with the uses and consequences of the same. Beaulieu manages a veritable plethora of character interactions – loves, hatreds, reversals, betrayals – and manages to make each of his characters feel unique, and alive. As usual, I won’t get too far into the plot, for fear of spoilers. However, I will say it picks up momentum, and higher stakes, as the narrative moves on – and the reader gains more context for and investment in the world, and the consequences of the character’s actions. There’s some periods of narrative lull, which might perhaps have been better paced, but typically, given the size of the text, the pacing works well. It takes a while for the narrative to pick up, but when it does, it has serious momentum, and proves very difficult to put down. Overall, this is a well-constructed piece of epic fantasy. It has complicated characters, in a unique setting, with a decently paced and compelling plot. We’ll see how the follow-up novels go, but this one is worth giving a look. After reading Bradley P. Beaulie's excellent "Twelve Kings in Sharakai" earlier in the year, I thought I'd go back and give his original series a go. It's got a lot to recommend it - original world, uncommon inspiration, complex family dynamics -though with a few rough edges, too. 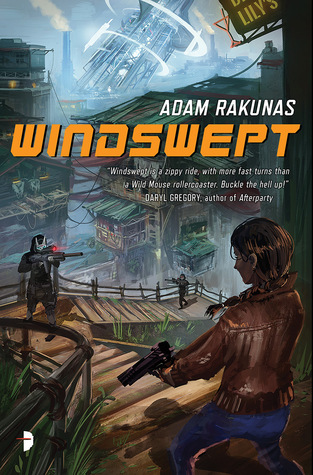 Windswept is Adam Rakunas’s debut novel. It’s a great mix of high-concept, discussing the roles and realities of labour and struggle in a spacefaring corporate future, and taut thriller – as our protagonist races against time to figure out what’s causing the city around her to fall apart, whilst dodging bullet and trying to find time to stop for a quick drink. It’s a book which has interesting things to say, and manages to express them successfully whilst keeping the reader both entertained and intrigued. Breaches, incidentally, is the word used for many of those living on the planet. In a universe which appears to be largely run by corporate fiat, and where many people work at interminable indentures for much, or all, of their lives, these individuals have chosen otherwise, and managed, somehow, to make their way down from orbit, looking for a better life at the bottom of the orbital well. They may find it, or at least something like it, with the Union, fronted by our protagonist – a sprawling labour organisation, which manages the non-corporate industry of the city. Unsurprisingly, however, the Union is a complicated place, filled with old rivalries and internecine internal politics. Rakunas doesn’t elide this, but lets the history between the protagonist and the remainder of the Union simmer in the background, inferred from asides in dialogue, or the very structure of the city. There’s a whole social structure on display here. A sense of Union members and their time ‘in grade’, indicating whether they get the best jobs. There’s the hunched, menacing spectre of the ongoing corporate presence in the city, in the appropriately named Thronehill. Then there’s the ‘Freeborn’, growing cane outside of the city limits, out of reach of the constant presence of the network everyone else is hooked into, independent, and sceptical of both Union and corporate promises. It’s a society in miniature, and the way it’s been structured makes it make sense – and it feels like an organic structure, accreted over time, a society which has been shaped by the people within it. In that society sits our protagonist. An ex-corporate high flyer, now serving as a Union recruiter; one whose retirement plan involves retrieving just a few more Breaches after their escapes. The wonderfully named Padma Mehta is cynical, self-interested, and always expects the worst from people. In this, at least, she’s rarely disappointed. Rakunas manages to bring to life a character who is selfish, but not entirely self involved – pragmatic enough to be effective, but with enough empathy to be understandable. She also does a pretty good line in kicking arse, and has some genuinely witty dialogue. It’s refreshing to see this approach – one in which the protagonist, whilst acting within semi (or indeed anti-) heroic constraints, recognises their own place within a system. Here is no Chosen One, rising up to overthrow a corrupt government – but a worn down, damaged individual, looking out for herself, and trying to do the best for those that depend upon her. And it works, it really does – the reader is drawn into the struggle with Padma, as her initial situation rapidly gets out of hand. Ruthless, willing to be physical, with a penchant for smart remarks and good rum, she’s an absolute pleasure to read. The supporting cast suffer somewhat by comparison. There’s some quirky characters in here – the entirely filthy Bloombeck, Padma’s old neighbour, for example, has the aura of sleaze and incompetence expertly evoked – but they’re really in the shade of the protagonist. Still, they work well within their roles, giving Padma people to play off of, argue with, and occasionally punch in the face, so overall that’s fine. Plot-wise…well, as ever, I don’t want to get into spoilers. I will say that Padma’s initial effort to recruit enough ‘Breaches’ into the Union is quickly subsumed into several different schemes, all with far larger stakes. The plot ratchets up the tension early, and releases it every so often in fist fights, boat chases, shoot-outs…there’s a fair amount of action here. But it’s wrapped around a narrative core which is startlingly perceptive. One with mysteries at the centre, which are gradually answered through the course of the text. One which takes the characters it provides the reader, and slowly tells us more about them – and there are more than a few surprises. This melange of fast-paced action, character study, social study and witty dialogue makes up a thoroughly enjoyable narrative treat – give it a chance, and it’ll reward your attention. Tomorrow will be a look at Windswept, the debut novel of Adam Rakunas. Unusually, it's a sci-fi novel focusing on a union organiser. Not someone out to save the world (though that might happen), just someone doing the best they can. There's gunfire, booze, chases, a lot of witty dialogue, and some really interesting ideas about social structures in the future - been enjoying it so far. 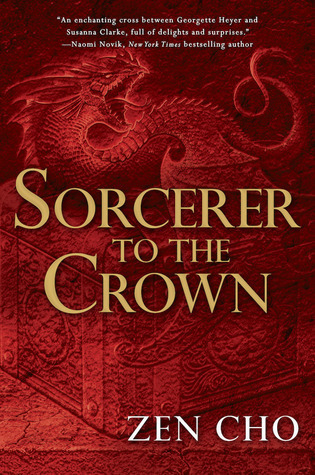 Sorcerer to the Crown is Zen Cho’s debut novel. It’s perhaps best described as magic-and-manners, sitting somewhere on the literary spectrum of Jane Austen and Susanna Clarke. It’s also rather good. The setting is Regency England – easily recognisable to anyone who had to read Pride and Prejudice at school. Filled with supercilious aristocrats, put-upon servants, elaborate entertainments, and even more elaborate language. But it’s a version of this England that we perhaps haven’t seen before. A version where there is a highly visible, if somewhat dysfunctional, society of magicians. Where the position of Sorcerer Royal comes with both privileges and assassination attempts. It’s a credit to Cho’s skill as an author that she manages to merge the cut-throat world of aristocratic parties and struggles to find a suitable husband, with the more literally cut-throat world of high-octane magic. It’s a very well realised world that Cho has drawn, and one which is instantly believable. Drawing on the tradition of mannered romances, even the tone of the prose feels appropriate to the genre conventions, lending authenticity to those parts of the narrative that seek to both subvert and conform to those conventions. The text feels slightly baroque, but not overwhelming, and the flow of both dialogue and description is suitably liquid – flowing easily through the reader, and asking them to just turn one more page. The descriptions, of London, of courtly ballrooms, of thaumaturgy – all have a matter-of-fact authenticity to them, wrapped within some nicely elaborate prose. The flow of the dialogue, in particular, is a joy – carrying the impression of a 19th century novel, but with a streamlined feel, making it a pleasant and intriguing read. It’s worth noting whilst discussing the prose, that this is one of the most slyly witty books I’ve picked up in years. There’s an undercurrent of dry humour which runs through the text, and it often has the capacity to surprise and amuse simultaneously. I chuckled often, and laughed aloud several times. Whilst this is a text which does treat with complex themes and issues, it’s also one which does not do so in too po-faced a fashion; the narrative invites the reader to share the joke, rather than taking itself too seriously. Our view into this world is split between two central characters. There’s the current Sorcerer Royal, the wonderfully named Zacharias Wythe, a man discriminated against by his own society both for his race and for his mysterious means of ascension to his position. There’s also (the equally splendidly named) Prunella Gentleman, who begins the tale in the confines of a school for magically inclined women. It exists in order to teach gentlewomen how not to exercise their magic – for reasons of propriety, of course. Both characters are artfully portrayed. Wythe has a certain nervous energy about him, and an occasional grim intensity which indicates a character with drive, focus, and determination. As the narrative progresses, we learn more about Stephen’s past, and how he ended up in the position he’s in. By contrast, Prunella is no less driven – in fact, perhaps more so. She’s vivacious, focused, perhaps slightly unscrupulous, occasionally ruthless, and utterly charming. The central relationship is between these two, as they rebound off of each other whilst dealing with the travails affecting English magic – and the author has managed to create a marvellous understated chemistry, both entirely believable and incredibly compulsive. There’s also a galaxy of supporting cast, ranging from wry colleagues of Wythe’s through put-upon schoolteachers to mysterious villains and the occasional Faerie. Some of the latter feel extremely strange, but perfectly real – and the supporting cast of thaumaturges and government officials feel no less than human. The plot begins with Wythe’s investigations into a sudden decline in the amount of available magic in England, and Prunella’s efforts to make a name for herself – but quickly spirals out to include a great many other opportunities for chaos. I won’t say more for fear of spoilers, except that each step on the journey with the pair of them is thoroughly enjoyable, and the eventual dénouement is both thoroughly fantastical and impressively human. Overall, this was a really enjoyable read. Warm, clever prose, filled with believable, charming characters in a compelling narrative. This one is definitely worth picking up. Tomorrow we'll be looking at Zen Cho's charming debut, Sorcerer to the Crown. It's a tale of manners-and magic, mixing magicians with the world of a Regency novel in the mode of Austen. It's also an extremely enjoyable read. The Dragon Engine is a fantasy novel by Andy Remic. It’s got some interesting world-building, a party of squabbling misfits, high stakes action, and… quite a lot of blood. The novel takes place as a party of heroes come out of retirement, heading into a mountain range in search of riches. Remic does a decent job of building out his initial world. The kingdom that these heroes inhabit is only sketched out, but depth is added in incidental dialogue between characters. There’s mention of villains from the past, wars which are slowly being forgotten, loyalties and betrayals bubbling under the surface of the world. Whilst the attention paid to this initial setting is a bit sparse, what is in place manages to feel vivid and alive. The setting shines, however, when it explores the Dwarven caverns that our party of heroes are planning to loot. There’s a cavernous claustrophobia to the underside of the mountains, a feeling of a society turned in on itself, self-contained and self satisfied. At the same time, there’s a wonderful sense of scale – the towering gates of the Dwarves, the intricacy and baroque nature of their works, is emphasised in a narrative style which otherwise feels very spare and clean. There’s a grandeur in the Dwarven city, but also a sense of statis, and Remic manages to tease these out and combine them without overwhelming or browbeating the reader. The characters are an interesting conundrum. They seem almost designed to fill roles – the axeman, the archer, the assassin, and so on. An adventuring party, off on a dungeon crawl. But the nature of these old heroes, the bonds that tie them together, are inferred and unspoken, and so we get hints of a more complex set of relationships through the cracks in the narrative. There’s moments of sparkling humanity in between the banter and the action. The axeman’s relationship with his ex-fiancée is particularly well done, given a sense of emotional freight and a level of nuance that it would have been nice to see explored further, across all the character relationships. There are other quiet moments between the characters of course, and it seemed like they had a lot of room to grow, if given the chance – hopefully that’s something we might see in later books in the series. The villains are a mixed bag. There’s a couple who feel a tad flat, more evil-for-the-sake-of-it than anything else. But there’s also a couple with more complex histories, especially once the Dwarven plot gets rolling. Whilst there’s still a lot of evil minions, there overlords have a bit more heft behind them. Much like the heroes, I’m hoping that this level of depth is something we might see strengthened and further explored in any later novels. That said, the lion’s share of the book, when it’s not sliding character complexity in behind the reader’s back, is the plot. The quest into the mountains, to retrieve a mountain of dwarven gold, is wonderfully self interested. It also, of course, doesn’t go even slightly to plan. Remic manages to pace the opening of the story perfectly, dropping the reader enough context not to feel lost, then ramping up into moments of action which are genuinely gripping. As the text progresses, and the reader picks up more of the world, the action sequences become grander, and the stakes higher. There’s some great stuff here – Remic’s fight scenes are elaborate, visceral, and gripping. Sometimes it feels like they go a bit overboard – but at the same time, this is a story which knows what it’s providing, and is hitting that mark. There’s sword fights. Bowshot. At one point someone steps on a spine. There’s blood everywhere, and most of the people who get an axe deserve it. The stakes for the characters gradually increase, and Remic certainly had me invested by the end. The novel as a whole is rapid, unrelenting, gleefully bloody, and happy to occasionally subvert expectations. I’d like to see the characters explored a little more, but was typically distracted by this when someone’s head fell off, or a chase began, or someone did a bit of cool magic, or…well, you get the idea. This is unreformed fantasy, filled with treasure, violence, the odd bit of magic – heroes you can understand, and villains you can hate. It succeeds very well at doing what it wants to do – and I’m hoping it’s going to expand on that as the series continues. 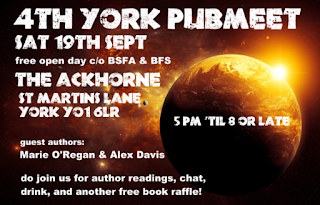 If you happen to be in York (UK!) 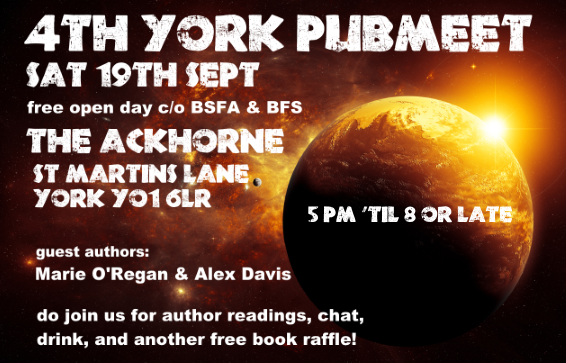 on the 19th of September, the BFSA and BFS are once again getting together to throw one of their renowned meet ups. This time the venue is the rather historic and thoroughly classy Ackhorne pub, in the centre of the city. There's going to be some talks by authors (the excellent pair of Marie O'Regan and Alex Davis this time!). There's going to be a book raffle. There's...probably going to be some drinks, if I'm honest. Starts around 17:00, and the formal parts finish about 8. The chat afterward tends to go on into the night, though. Anyway, come along, if you're able; it should be a lot of fun.